The Tello Obelisk is a prismatic granite monolith from the archaeological site of Chavín de Huantár in north-central Peru. The Obelisk features one of the most complex stone carvings known in the Americas for its time. Chavín is situated at 3,150 m in the upper Monsa River drainage, between the Cordillera Blanca and the Cordillera Oriental, two of the three ranges in the Central Andes. Chavín is located on a pass to the Callejón de Huaylas, a high elevation valley between the Cordillera Blanca and the Cordillera Negra, the western range. Radiocarbon measurements indicate that construction of the initial phase of monumental architecture at Chavín, a U-shaped platform mound known as the Old Temple, began around 850 B.C. The U-shaped platform frames a 40 m plaza with, centered on the axis of the monument, a 21 m in diameter sunken circular court lined with cut stone blocks featuring low relief carvings. The Tello Obelisk was probably set in the center of this Old Temple sunken court. In this setting the surrounding lofty, snow-covered peaks of the Andes are visible towering above the monument. The correlation of the Tello Obelisk to the Old Temple is supported by stylistic comparison with the Lanzón, another important monolith at Chavín. The Lanzón remains embedded within the Old Temple, securing its temporal placement. The Lanzón and the Obelisk are unique exceptions to the three groups of Old Temple sculpture at Chavín; ashlars carved in flat relief, three-dimensional tenoned heads set into the exterior stone walls of the platform mound, and mortars. 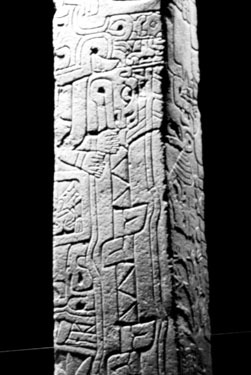 The Obelisk was discovered by Julio C. Tello during excavation of the site and thereafter moved to Lima, Peru, where it is currently housed in the Museo Nacional de Antropológia é Historía. The photographs in this paper are from a transparency I took at the Museum in 1988. The Obelisk, a slightly tapered quadrangular solid, is 2.52 m tall with about 0.32 m and 0.12 m wide sides. A notched upper section narrows the upper one-eighth of the two wide faces to about 0.26 m. Excepting the notch, the four sides are planar. The full girth at the base is near 1 m, and the form uniformly tapers to about 0.87 m in girth at the notch. All four sides or faces are sculpted in bas-relief carvings from top to bottom (Figure 3). The sculpture includes figures in relief with a background plane and subtractive sculpting of the foreground plane. The carvings are described in greater detail below. The Tello Obelisk is a white granite sculpture. At Chavín the nearest source of granite is located at 18 km distance from the ruins. Granite, one of the most common of the igneous rocks, is an entirely crystalline, unstratified, dense, and immensely hard, chisel-resisting stone. Granite is composed of quartz, mica, hornblende and feldspar. Feldspar is the most abundant mineral in granite. The higher the quartz content, the harder the granite. Granite is one of the most durable of stones, and is highly resistant to the destructive forces of the elements. Granite is therefore not only quite difficult to carve but also can take a very high polish. An advantage of granite is its beautiful and consistent color. The color of granite depends on the feldspar it contains, as well as the quartz and hornblendes. In my Kodachrome transparency the Tello Obelisk is a light fulvous sienna in color (perhaps shifted towards yellow by the indoor lighting). During the Early Horizon (900 B.C to 200 B.C. in the Rowe-Lanning chronology) the prehistoric cultures of Peru lacked metal tools. If no appropriately shaped stone is found one must be quarried. To quarry raw material, blocks of stone need to be split by wedging. First a series of holes are drilled in a straight line at close intervals. Wedges are then driven into the holes, applying equal pressure along the length of the split. Wooden wedges can be soaked to split the stone, and this is the probable method used in ancient Peru. Wedge holes have been found in ancient Egyptian quarries. Quarrying is followed by moving, lifting and transporting. Given the distance from the quarry to Chavín, the mountainous terrain and the lack of draft animals or wheels, it is likely that roughing out the shape of the stone preceded transport to the site. After quarrying each step involves removing material from the original mass, an entirely subtractive process. Just as metal wedges are used today to quarry blocks, so also are metal tools used to carve granite. Material available for tools is an important factor in methods and process. In Neolithic Peru the sculptures had to be carved with hard stones. Stone is worked by a series of simple steps. The two basic categories of stone sculpture tools are percussion and abrasion tools. Percussion tools are either hammers and chisels in combination or axes. The heaviest hammers used today, sledge hammers, weigh about 2 kilos. Carving granite is typically accomplished using a chisel set perpendicular to the surface. The harder the stone the more perpendicular to the surface the chisel needs to be. Abrasion tools work by rubbing away material. Abrasion tools are used to cut, shape, smooth or polish. Polishing is accomplished by fine abrasion and requires a considerable expenditure of time and energy. The Chavín carvings have lustrous surfaces, evidencing polishing with a series of abrasives. During abrasion the sculpture is typically soaked with water and abrasive stones, such as silicon carbide, are applied in descending degrees of grain and of hardness. Very fine sand is used as an abrasive for the highest degree of polish. The properties of stone always have an influence on the art. Granite sculptures rarely have undercuts because it is a hard, brittle material, prone to breaking during percussion. Once a piece breaks away from a sculpture it cannot be replaced. The planar form of the Tello Obelisk is well suited to the material. There are no truly sharp edges and all the lines, grooves, incisions and corners are at least somewhat rounded. The relief difference between the background plane and the face is shallow, perhaps 3 cm at most. The durability, internal consistency, strength and hardness of the granite also makes possible the overall form, the narrow, tall obelisk shape. Neither the material, the form, nor the technology have attracted the attention of the many writers who have focused on the Tello Obelisk to the same degree as the iconography. The fame of the Obelisk is attributable to the iconographic richness of Chavín art, and the obelisk is the most iconographically complex of the Chavín objects. It is also arguably the most unique in iconographic content. Chavín art is basically naturalistic, and the major subjects are humans, avians, snakes, felines, other animals, plants and shells. Idealized forms of these elements are covered with abundant smaller elements, often as metaphorical substitution of body parts. A typical and well known example is the substitution of snakes for hair on the Lanzón. Another unique feature of the Tello Obelisks iconography is the geographic scope of its elements. The Chavín civilizations interaction sphere included Perus three major ecological zones, the desert coast, the highlands and the humid tropical forests. 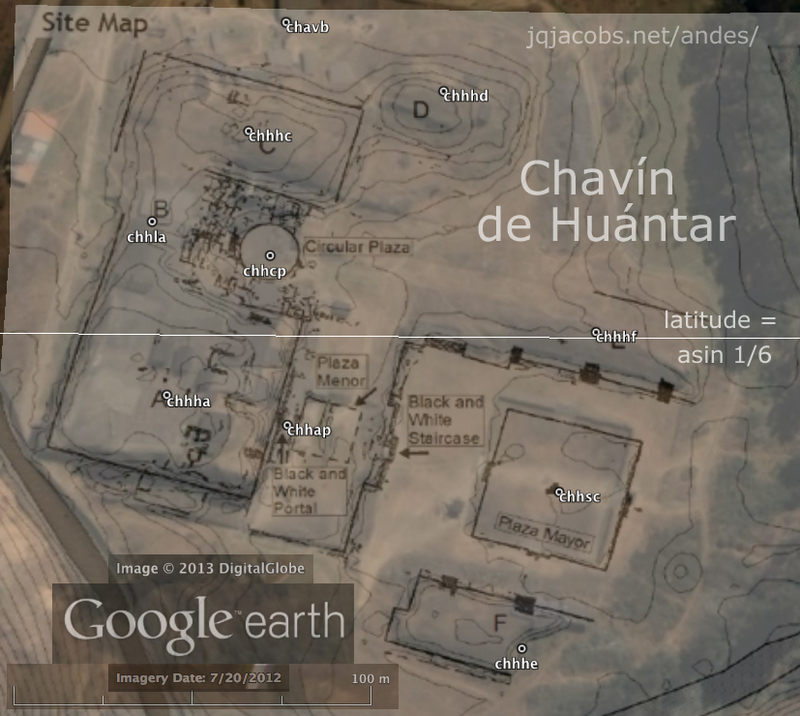 Chavín is located at an important route from the Pacific Coast to the Amazon Basin. Via the Santa and Monsa Valleys it is possible to cross the Andes by crossing only one high pass. Chavín is located on this route and the Obelisks iconography reflects the natural world in the tropical lowlands, the coast and the highlands. Chavíns unique interregional synthesis is also reflected in the monumental architecture. The Old Temple combined the U-shaped pyramid and the sunken circular court, diverse coastal traditions, with stone masonry unique to the highlands. The antecedent for relief carvings also has many coastal antecedents, in both stone and plaster. Chavíns iconography and architecture is seen as an unprecedented unification of previously heterogeneous elements. This is particularly the case with the Obelisk. The Obelisk features, in two representations, a zoomorphic figure dominated by cayman attributes. Caymans are found in the low tropical forests. The carvings convey a single composition in several narrative units. Lathrop referred to the figures as a primordial deity and the "overarching cosmological symbol in the culture of Nuclear America." The cayman is an important component in the "Tree of Life" figure in Middle American iconography, where it is usually depicted in a descending, or partition posture, as the base of the tree and with its tail replaced by vegetation. Campana believes the Tello Obelisk narrates a cosmological myth. Wheatley sees the Obelisk as a very complete and detailed model of the cosmos. While the speculations about the meaning of the iconography are intriguing, I think the meanings will always remain in the realm of the unproven. Nonetheless, I find it significant that the symbolism evokes meaning to those who view the iconography today. These cosmogonic interpretations arise in part from the diverse representations of life forms in the imagery, and in part from ethnographic analogy and contemporary myths. The two great cayman representations are nose upright and, in scale, are nearly the size of the Obelisk. A harpy eagle rises above the snout of one of them, giving the impression of a sky element at the top of the monolith. The water element is insinuated by the cayman and also by Spondylus and Strombus shells, elements from the Pacific Ocean. Cultivated plants of Amazon Basin origin are associated with the heads, mouths and noses of faces with pronounced canine teeth, possibly jaguar representations. The Obelisk features the largest mouth emblem of all Chavín mouth depictions, and has 15 exaggerated large mouths among the 50 mouths featured. The many faces, mouths, plants, animals, anthropomorphs, shells, snakes, and geometric forms fill the space on the monolith and cover the body of the cayman. Stone itself can impart meaning to an object. Granite, as the hardest locally available stone, conveys a message of immutability. It also points to the probable desire of the monuments creators to hewn a long-lived object. The shape of the object, especially in relation to possible function, may also impart some meaning. If the slender monolith was used as a gnomon to tell diurnal and seasonal time the imagery may be related to the seasonal renewal of life or have meaning within the context of the passage of time. Within this context the very ancient life form of the cayman, and the very recently evolved life forms of domesticated plants combine to present a possible representation of the changes in life in relation to time, a concept more in keeping with a "Tree of Life" interpretation and an understanding of evolution and the interrelationships of all life forms. The obelisk also has the form of a sprouting plant shoot. Meaning can also be sought in the objects location. The Tello Obelisk was, in all probability, located on the same, central east-west axis as the Lanzón, the only other prismatic granite sculpture at the site. This axis aligns facing sunrise (103 degrees east of north), reinforcing the interpretation of the monolith serving as a solar gnomon. Lathrop regards the Tello Obelisks location as a material representation of an axis mundi, a placemark representing the center place. The configuration at Chavín is reminiscent of the configuration at Tiwanaku, where a millennium later it is repeated by the Ponce monolith inside the Kalasasaya monument, and a tall, slender monolith in the sunken court, in front of and centered on the Kalasasaya axis and aligned to the Equinox sunrise. This correlation reinforces the possible relationship to time. The Tello Obelisk is an intriguing artwork worthy of close study. While its interpretations may never be fully supported, it definitely evidences the complexity of the iconography of its makers. The Obelisk forces us to ponder the thoughts of its makers. The intense overlays and metaphorical substitutions of so many diverse aspects of nature make us question what its makers thought about the relationships of these life forms. Perhaps in so doing the Tello Obelisk is carrying out the intended function of its creators, to serve as an immutable testimonial about the relationships they observed in the diverse environments of desert, mountain and jungle, and to stimulate those who view the imagery to contemplate lifes relationships. If so, this is a more impressive accomplishment, by my thinking, than the laborious technological feat of its creation. Burger, Richard L.,	1992. The Sacred Center of Chavín de Huantár, in The Ancient Americans, Art from Sacred Landscapes, Edited by Richard F. Townsend, The Art Institute of Chicago, Prestel Verlag, Munich. Burger, Richard L.,	1992 Chavín and the Origins of Andean Civilization. Thames and Hudson, London. Campana, Cristobal 1995 El Arte Chavín, Analisis Estructural de Formas é Imagenes. Universidad Nacional Federico Villareal, Lima. Lanning, E. P.	1967. Perú before the Incas. Prentice-Hall, Englewood Cliffs, New Jersey. Lathrop, Donald W.	1982 Complex Iconographic Features by Olmec and Chavín and Some Speculations on their Possible Significance. In Primer simposio de correlaciones antropológicas andino-mesoamerican. Edited by Jorge Marcos and Presley Norton, pp. 301-327. Escuela Politécnica del Litoral, Guayaquil. Lathrop, Donald W.	1985. Jaws: the Control of Power in the Early Nuclear American Ceremonial Center. In Early Ceremonial Architecture in the Andes, Christopher B. Donnan, Editor, pp. 241-267, Dumbarton Oaks, Washington, D. C.
Moseley, Michael E.	1992 The Incas and their Ancestors, The Archaeology of Peru. Thames and Hudson, London. Olsen Bruhns, Karen 1994 Ancient South America. Cambridge University Press, Cambridge. Penny, Nicholas	1993 The Materials of Sculpture. Yale University Press New Haven. Rich, Jack C.	1947 The Materials and Methods of Sculpture. Oxford University Press. New York. Rockwell, Peter	1993 The Art of Stoneworking: a Reference Guide. Cambridge University Press, Cambridge. Rowe, J. H.	1962 Stages and periods in archaeological interpretation. Southwest Journal of Anthropology 18:(1), pp. 40-54. Timberlake, Marie	1988 The Cayman in Chavín Art: A Re-evaluation. Thesis (M.A. ), Arizona State University. Wheatley, Paul	1971 The Pivot of the Four Quarters. Aldine Publishing Company, Chicago. Chavín de Huántar Placemarks for Google Earth. © 2013 James Q. Jacobs. All rights reserved. Cite as http://www.jqjacobs.net/andes/tello.html, published 2000.